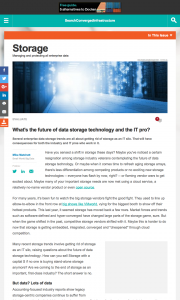 What’s the future of data storage technology and the IT pro? An IT industry analyst article published by SearchConvergedInfrastructure. Several enterprise data storage trends are all about getting rid of storage as an IT silo. That will have consequences for both the industry and IT pros who work in it. Have you sensed a shift in storage these days? Maybe you’ve noticed a certain resignation among storage industry veterans contemplating the future of data storage technology. Or maybe when it comes time to refresh aging storage arrays, there’s less differentiation among competing products or no exciting new storage technologies — everyone has flash by now, right? — or flaming vendor wars to get excited about. Maybe many of your important storage needs are now met using a cloud service, a relatively no-name vendor product or even open source. For many years, it’s been fun to watch the big storage vendors fight the good fight. They used to line up elbow-to-elbow in the front row at big shows like VMworld, vying for the biggest booth to show off their hottest products. This last year, it seemed storage has moved back a few rows. Market forces and trends such as software-defined and hyper-converged have changed large parts of the storage game, sure. But when the game shifted in the past, competitive storage vendors shifted with it. Maybe this is harder to do now that storage is getting embedded, integrated, converged and “cheapened” through cloud competition. Many recent storage trends involve getting rid of storage as an IT silo, raising questions about the future of data storage technology. How can you sell Storage with a capital S if no one is buying stand-alone storage anymore? Are we coming to the end of storage as an important, first-class industry? The short answer is no. Accounting-focused industry reports show legacy storage-centric companies continue to suffer from thinning margins for their high-end hardware arrays. But the collective storage footprint in general is growing. With data volumes exploding from globalized applications, web-scale databases, big data analytics, online archiving and that little internet of things opportunity, all those new bits will have to go somewhere. Maybe the job won’t even be called storage administrator in a few years, but rather something like chief data enabler. 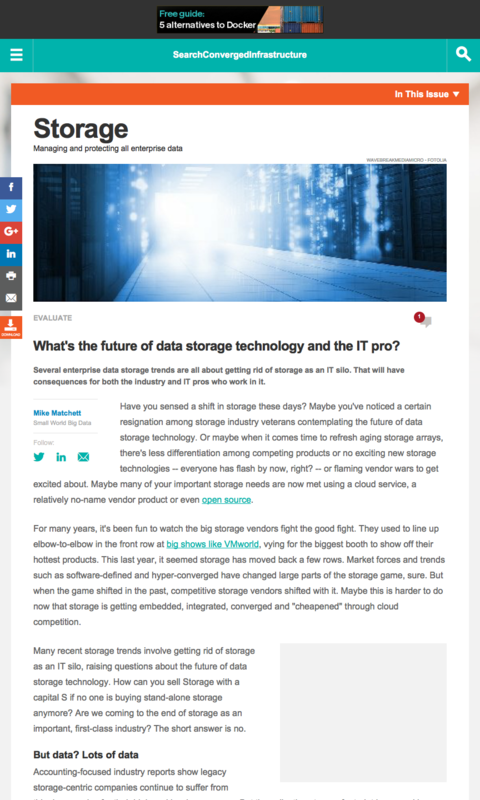 This entry was posted in IT Analyst, Published Articles and tagged convergence, SearchConvergedInfrastructure, Storage by Mike. Bookmark the permalink.